You know what I want for breakfast? Mmmmmm … I really wish I could have an Almond Joy candy bar … but in a healthy, hearty, keep-you-powered-up-all-morning breakfast! 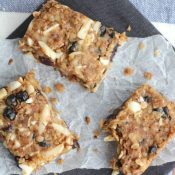 Sweet coconut and crunchy almonds, with just a hint of creamy chocolate. 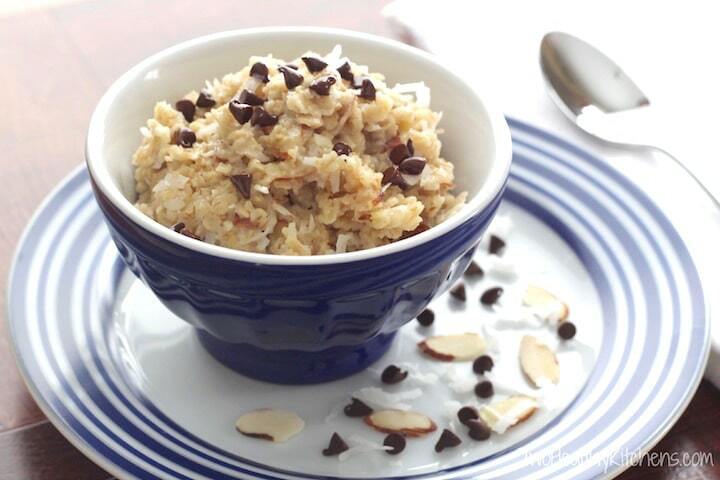 All swirled together in a deliciously warm and satisfying bowl of almost-instant oatmeal … mmmmmmm! And this got the ultimate double-stamp of approval. Not just because my family absolutely loves it and excitedly asks me to make it regularly … I mean, that’s a given for recipes we share with you here at THK. Nope! It’s because of what happened one day last weekend … (picture a time warp here) … when my family made a spur-of-the-moment decision to hit the slopes of our local ski resort (as we headed into our umpteenth-straight, freezing cold Ohio day). My husband gallantly offered to make breakfast while the rest of us showered and grabbed our gear. The kids wanted Almond Joy Oatmeal (again! ), so I handed Romeo my laptop with the draft of this recipe post (and experienced the strange and wonderful sensation of letting someone else handle breakfast duty)! I grabbed a pencil and frantically wrote down his little gems of wisdom before I forgot what he’d said – this was the very best and most glowing recipe review I could have hoped for! 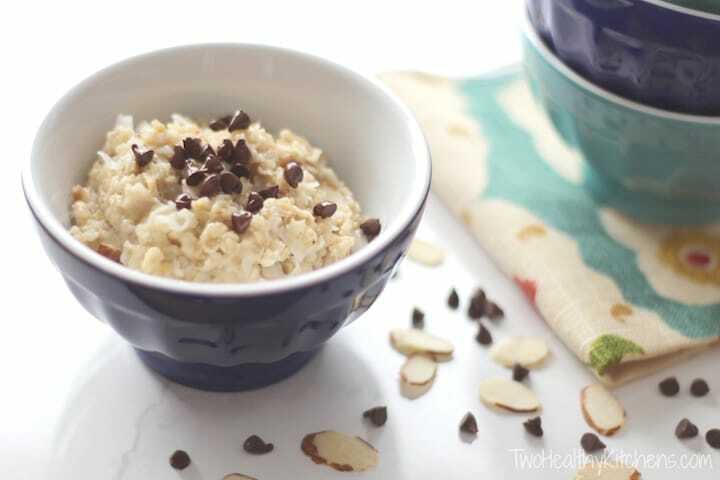 But really – this 10-minute oatmeal is absolutely worthy of a double-stamp of THK approval! I don’t mind one bit that my kiddos request it all the time, because I can whip this together and check breakfast right off my list (even when I don’t have the luxury of letting someone else take over the kitchen)! I’m not kidding about the 10-minute prep! (Well, ok … actually I kinda am … it’s probably more like 7.2 minutes! But “7.2-Minute Almond Joy Oatmeal” just didn’t have the same ring!) The most time-consuming part of the whole process is just getting the milk and water to boil! So fire up your most powerful burner, and get ready to meet your new favorite oatmeal! Once the liquids boil, reduce the heat to low. Add the oats and then stir in all other ingredients except optional chocolate chips. Serve with about ½ teaspoon chocolate chips sprinkled on top of each serving, if desired. Yum! This was the perfect Sunday morning brunch treat. Almond Joys are one of my favourite, and this recipe is probably going to be a staple in our house. My 6-year-old particularly liked it and my 8-year-old was happy to help stir and then decorate the bowls of oatmeal with mini chips. Note: Substituted ground almonds for slivered. Thanks THK! I was looking for an easy way to change up my oatmeal and found this on pinterest. 10 minutes later I had a bowl full of YUM YUM YUM! This my just be my breakfast for the next week. Time to go through all your other recipes now! If you’re looking for a little more variety with your oatmeal, we 100% recommend 10-Minute Pumpkin Pie Oatmeal, and 10-Minute Apple Pie Oatmeal, 10-Minute, No-Cook Overnight Oats with Apples, Cranberries and Cinnamon, and Cool and Creamy, 5-Minute, No-Cook Blueberry-Almond Oatmeal! That should keep your oatmeal changed up for a little while! Now that’s my kind of breakfast! What a great bowl of oatmeal! While I was pregnant I ate oatmeal daily…now that I am sleep deprived and basically throwing whatever is available in my mouth as I wake up in the morning I have gotten off the oatmeal bandwagon. 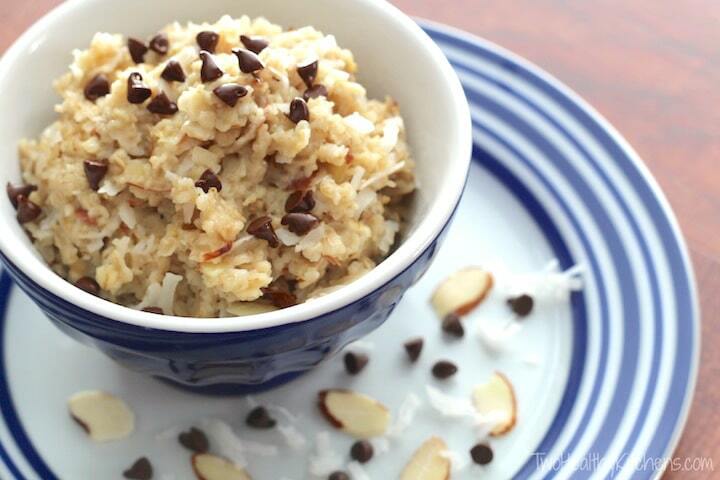 This bowl of oatmeal makes me want to get back on it–looks so wonderful and delicious! 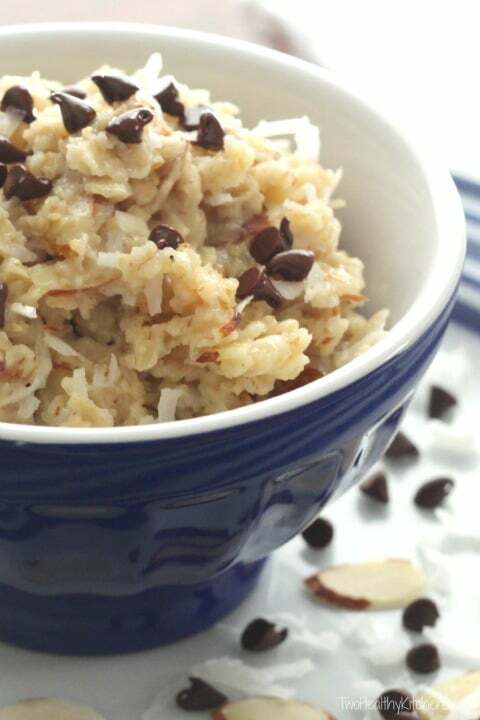 This oatmeal sounds like the perfect way to start the day – YUMMY! Almond joys are chocolate bars, right? We don’t get them over here (in Australia) but I’ve been reading about how delicious they are! 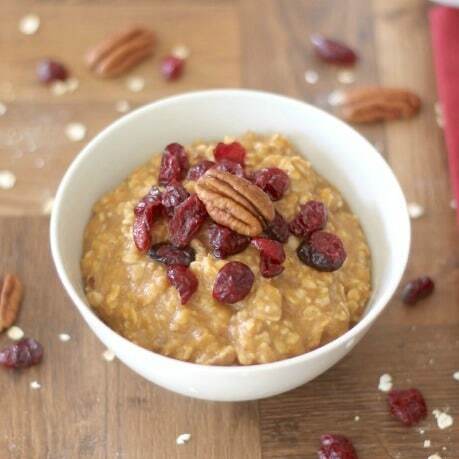 This oatmeal looks fantastic for a bit of indulgence on a busy morning. Deliciously easy! Thanks Shelley! Tried this and I loved it! What an awesome breaky!!! I love almond joy candy bars!! So I know I will just love this oatmeal!! What a great breakfast! This looks fantastic Shelley – I love almond joys, so having one for breakfast? I’m all in! Delish and easy too. How can you beat that? what a healthy looking oatmeal! 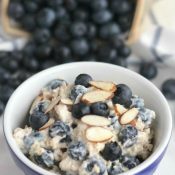 I’ve been seeing all these delicious oatmeal recipes lately and now I am dying to try some of them. 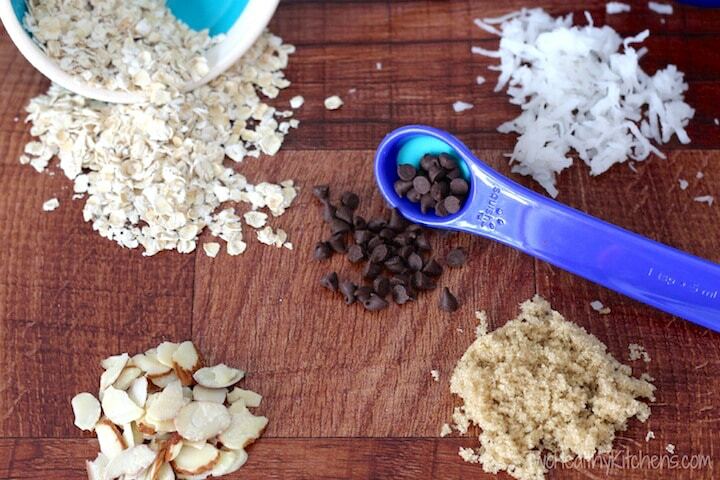 Of course, I love the coconut, almonds and brown sugar in this oatmeal. Glad to see that it received the stamp of approval from everyone! I love recipes using quick oats, I need to try this! Looks delicious! Yum! 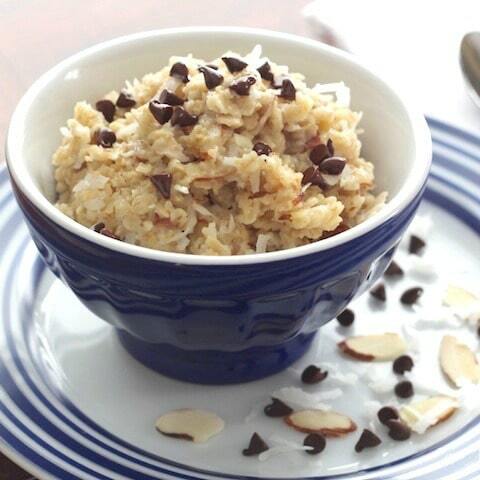 Love the”10-Minute Almond Joy Oatmeal”. This is a great variation on an old stand-by. Keep it coming. This looks great! And, I made those Almond Joy Bites, so I share your love of all things Almond Joy! What a cute story about your husband. I do most of the cooking, but Dan is pretty good in the kitchen. He’ll tell you it’s because I taught him well. I just blush when he says that. Thanks for sharing this recipe, it looks fantastic! Genius! Love almond joys so gotta love this too! Hey, kuddos to the hub for steppin’ in and servin’ it right THK-style! Sounds lovely! I have oatmeal every week-day morning pretty much and if I have any chocolate in the house I always sneak in a square or two! 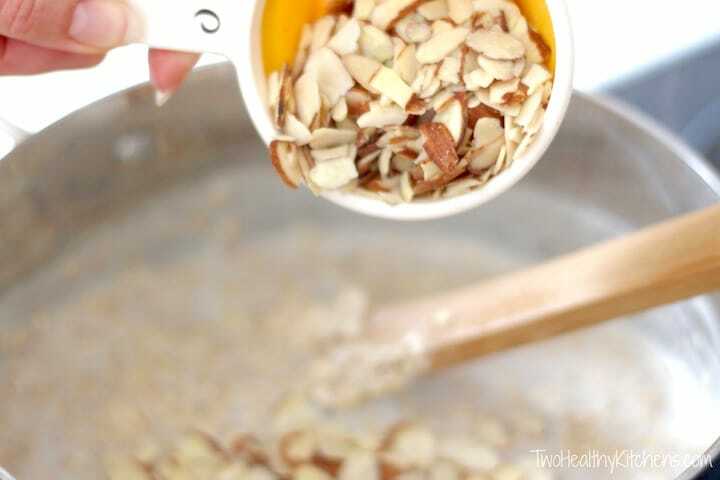 Love the idea of adding almonds and brown sugar. Bet it has a lovely caramel taste! Too bad I didn’t see this sooner today so I was able to make it for breakfast :–( This looks beyond fantastic – dessert for breakfast is my favorite! And the fact that it’s so easy to make is great. This is almost a dessert for breakfast…what’s not to like? 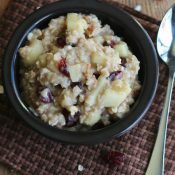 I will definitely try this recipe since we often have our “boring” oatmeal for breakfast. Just too funny! Food can actually be easy to make?! Every time I ask my husband to cook dinner he just looks so frightened. Making anything that requires following a recipe is not his forte. He asks a thousand questions!! lol No questions asked on this recipe! 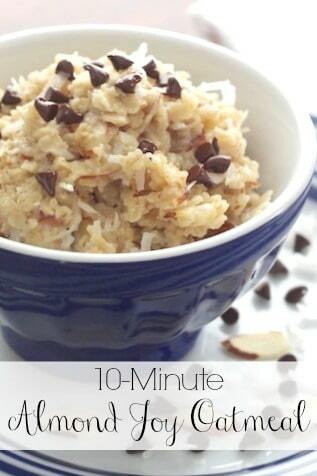 How can you beat 10 minute oatmeal! Sounds absolutely delicious! This sounds great and I can’t wait to try it. It’s like I saw a unicorn-love that! I’m out of coconut, but putting this on my must try! And I don’t even have to get my kids ready to ski. Reminds me of when we had a checklist. They used to go every weekend with their dad and it was such an effort. Finally after always forgetting something they came up with a checklist and all was well!